How many products type for seller? I want to find the shop as their address, name or zip code. Is it possible? Yes, of course. Our products is available this features. When my seller is off for their holiday, if they don’t want to open the shop in this time. Can they show the noticed for my customer? Is it possible to add local seller’s location (map) with this product?? Is it possible to integrate multi language translating option? Because I want to make an ecommerce store with English and my regional language? Yes, our products support all the languages if Magento supports that. Will this module work in multisite? I can set any commission for each seller? Yes, you can set the different commission for each seller. Can seller add facebook, instagram and twitter… account? Yes, you can add all the info for your seller. 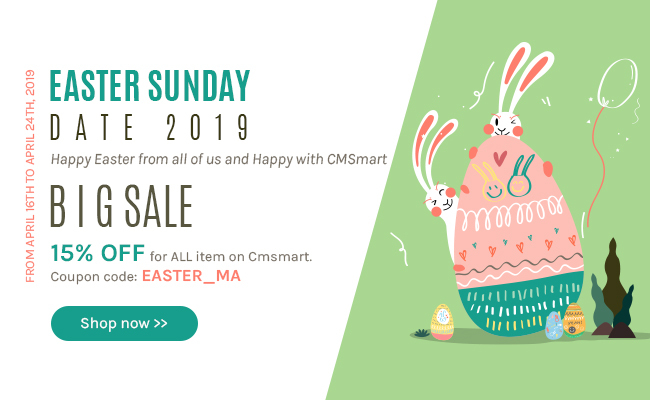 You can always download the purchased items for life time as it still for sales status on the Cmsmart Marketplace. Please come to the Download section to immediately download the products right after payment. However it is important to remember that when an item is removed from the Market sites, it will be removed from your Downloads page as well. We offer the download page as a convenience for buyers, but we can make no guarantees as to the ongoing availability of the files you have purchased. I do not have a PayPal account. Do you support other payment methods? Yes! You should know that PayPal supports including all major types of Credit cards. Visit PayPal for more information. So you still can pay via PayPal with your credit card or E-check. We also support Credit Card payment via Onepay.vn and Skrill. Can I customize products to suite my need? Yes. You can modify the product at your discretion for your own web-sites. However, you can’t resell or place the modified extensions (as whole) for downloads on your websites. I did the payment, while I have not received the download link? How long can I download the updated product? What is the different between Auto Renewal Price and Standard Payment Price? -Auto Renewal Payment: with this package, you have 3 or 6 months to receive our support, download and upgrade FREE. But, after 3 or 6 months you only pay a small recurring fee for each 3 or 6 months, you DON'T need to buy the product again. - Standard Payment: You only pay ONCE for this payment, you will receive our support, download and upgrade free in 3 or 6 months. But after 3 or 6 months, if you want to upgrade, download or support, you HAVE to buy again. Extension can support Magento 2 version 2.3? CPanel feature Builder (Comming soon)?